Rebatched soap is a soap making method that involves working with a previously made cold process soap batch. We typically rebatch soap when a soap batch went wrong, but we don't want to waste the ingredients. For example, maybe we realize that we forgot to add an oil and now the soap is lye heavy or maybe it is simply because we didn't like the finished design. We reuse the ingredients from the botched batch to make a new soap that people will love. Read more to learn how to rebatch soap. 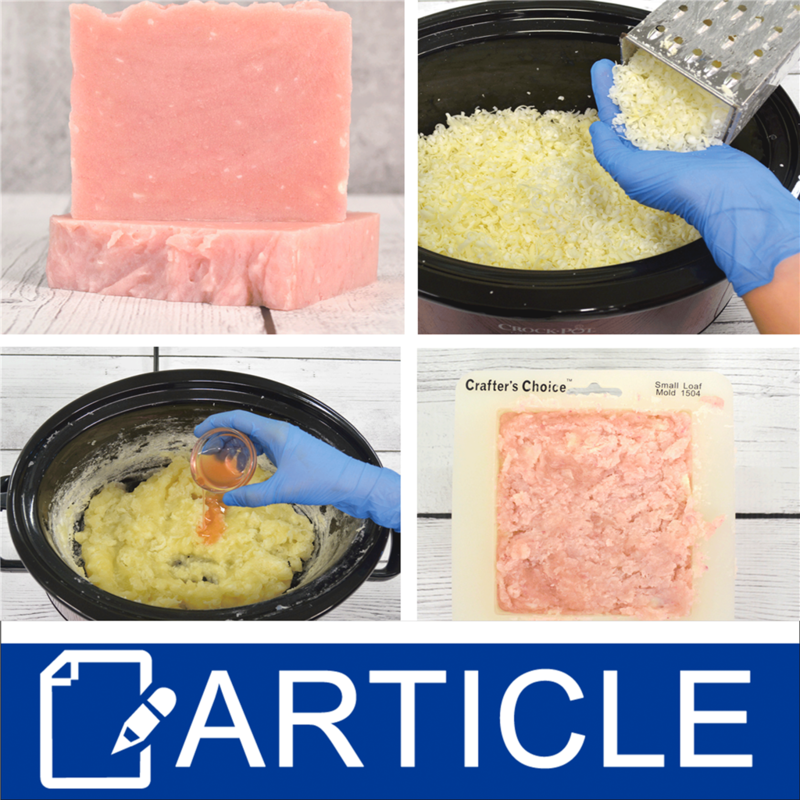 The first step to rebatching soap is to bring the soap to a gel consistency. Begin by grating the soap. (Be sure to wear gloves if your soap is lye-heavy!) Next, heat the grated soap on warm or low in a slow cooker. As the soap heats, it will start to turn translucent after about two hours. Keep a watch on it. If at anytime during this process it starts to burn add water and be sure to occasionally scrape the sides to minimize scorching. Here we grated a chamomile infused soap that was too lightly fragranced for our taste. Depending on your original recipe, you may choose to add more ingredients to your soap. If your soap was lye heavy, you will definitely need to add back the oil that is missing. (We only recommend rebatching lye heavy soap if you know exactly what is missing from your recipe.) In the pictured soap, we added fragrance, color and Cranberry Butter Blend. We used Hollyberry & Plum Fragrance Oil that was pre-mixed with Vanilla Color Stabilizer for CP Soap and Plumbery Pink Mica Powder. Once the additives are well cooked into the soap, you can mold the soap batter. The batter will likely be a thick consistency, and may need to be scooped into a mold. Rebatched soap has a very rustic look, and it is normal for it to appear thick and uneven. Unmold after the soap hardens and let cure.